When I was a girl, I used to love ice skating in Central Park, either on the pond if it were frozen enough or the skating rink. There was nothing like the feeling of gliding across the ice on a cold winter's day. 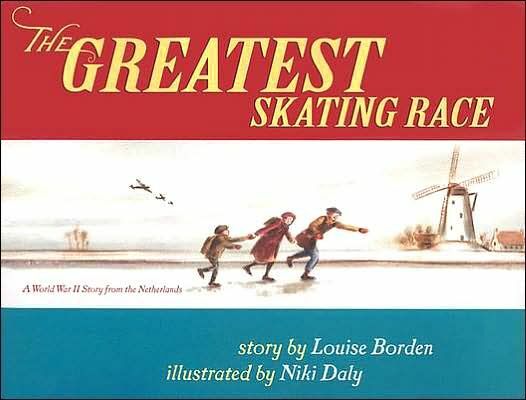 So when I saw The Greatest Skating Race by Louise Borden sitting on a bookshelf, I knew I just had to read it. Written in free verse, the story is set in the Netherlands in December 1941. Ten-year-old Piet Janssen was born to ice skate. His father's family had made and repaired ice skates for many generations, and Piet is looking forward to the time he is old enough to skate in the Elfstedentoct just like his hero , Pim Mulier. Mulier has skated the 200 kilometer/124 miles race in record-breaking time in a bitter cold December, much like Holland was experiencing in 1941. But Holland is under German occupation and although there is no restriction on skating, there just are much of the need supplies left for Piet's grandfather to make or repair skates. In fact, there isn't much of anything left after the Germans took what needed. But for Christmas, Piet receives a little red notebook. In it, he begins to plan and train for his entry in the Elfstedentoct...someday. The Janssens are kind people and help others whenever they can, especially during the bitter cold winters that Europe has been experiencing since the war began. One Friday, when Piet comes home from school, excited to show his mother his perfect spelling test, he learns that the father of a school mate has been arrested for possessing a radio and sending messages to the Allies. It is decided that his children, Johanna and her little brother Joop Winkelman, need to get away to safety. Which means that Piet, Johanna and Joop would skate the frozen canals to Brugge, Belgium, a distance of 16 kilometers/10 miles past German checkpoints all along the way, a long distance for two 10 year olds and one 7 year old after a day at school. And so the three skaters begin their journey. They don't get far before they run into their first German sentries, who stop them and become very suspicious when they see the Elfstedentoct map Piet had drawn in his red notebook for training purposes. A nice border map, one guard says. Finally the other guard recognizes the name of the race. The children are allowed to go on, but can they fool every sentry at every guard house they will have to pass and arrive safely in Brugge or be caught and arrested? And even if they get by the guards, can little Joop complete the arduous journey? 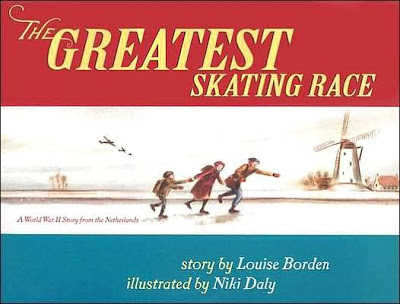 The Greatest Skating Race was such an exciting story and so well told that I had to keep checking the spine of the library book I was reading to remind myself that it is fiction. And although this is technically a picture book, it is really designed for middle grade readers. It is an engaging and beautifully written story that demonstrates the bravery and courage of children caught up in a war and their understanding of just how serious things were. An exciting story, it really captures the fear and tension that people experienced living under Nazi occupation continually felt. The illustrations by Niki Daly, which are done in colored pencil, ballpoint pen and watercolor with digital enhancement, beautifully convey the freezing winter weather, the beauty of the country and the fear, the determination and even the innocence of the children in cold wintry tones. The Elfstedenstoct is a real race that can only be done if the ice in the canals along the 11 city route are all frozen to 15cm. Unfortunately, it doesn't look like a race will be held in 2013 and in fact there hasn't been one since 1997. Pim Mulier (1865-1954), Piet's skating hero, did indeed complete the Elfstedentoct just as it is described in The Greatest Skating Race. Wow! That was a suspenseful book review. You had me nervous there. I hope I can locate this book. This is a nice book for kids and it was pretty suspenseful. I am beginning to really like historical fiction picture books for middle grade aged kids. I wonder how they feel about them. This sounds like a fun book. I love ice skating and history. I am definitely intrigued and plan to check this one out if I can find it. :) Awesome review! Thanks, Stephanie, I love ice skating as well and that was what drew me to the book. I knew about people skating the canals but had no idea how extensive it was. I hope you enjoy this one as much as I did. I thought the same thing, also there more about Norway recently. Unexplored territory, I guess. It's so good to hear from you again, Nan. I hope all is well. Yes, I read Hans Brinker as a young teen and still have around somewhere. I loved it what I read it and now I may have to find it and have a nice reread. Thanks for reminding me about it.